A sockeye pair in the Adams River. Every four year, British Columbia throws a three-week-long party with over two million guests-of-honor. And, you are invited to come along - October in 2010, 2014, 2018 . . . While travelers from all over the world enjoy British Columbia's scenery, 15 million Fraser River sockeye salmon will return home to BC after two years roaming the broad Pacific. Those adult sockeye that manage to avoid a host of predators (including fishermen) will battle the turbulent Fraser River and Thompson River 500 km into the heart of southern British Columbia. They will fight everything in their search for the streams that gave them life almost four years earlier. 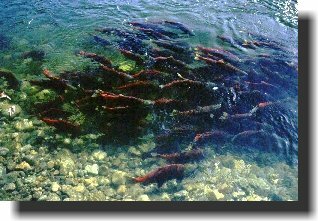 The 12-kilometre-long Adams River will be the ultimate destination of as many as two million of the returning sockeye. 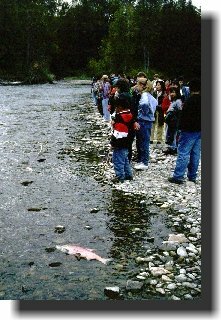 In fact, sockeye salmon return to the Adams River every year. But, the migration that occurs every fourth year dwarfs the others, having reached as high as 3.6 million sockeye in 2002. 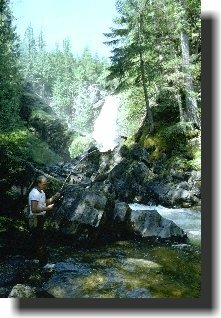 With approximately 65 hectares of stream bed, the diminutive Adams River rates among the richest natural spawning streams in North America. It is also the site of the quadrennial Salute to the Sockeye, a mid-October celebration of the return of the crimson sockeye, once the BC Interior Native's most important single food source. Four years earlier, the parents of the returning sockeye followed the same waterways, mated, laid their eggs in the coarse gravel stream beds, and died. The eggs slowly developed over the winter, then the warming waters of April and early May induced the tiny alevin to leave the gravel, and the spring freshet carries them down to Shuswap Lake. For a year, the young salmon roam Shuswap Lake, dodging predators and feeding in the shallows of the H-shaped lake's many bays and inlets. Then in May and June of their second year, they again ride the freshet. 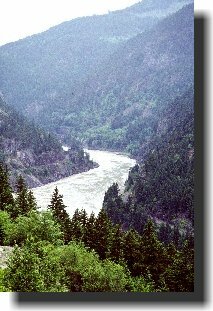 This time it is not a short jaunt down the riffled, swirling waters of the spawning streams, but a rough and tumble 480-kilometre-ride through the rapids of the Thompson and Fraser rivers to the Pacific Ocean. Of an estimated 100 million sockeye fingerlings that leave Shuswap Lake in the spring of a peak year, approximately 10 per cent are expected to return to the British Columbia coast in the autumn four years later. In their Pacific wanderings that take them as far away as Japan, natural predators and ocean-going fishing vessels will take their toll. 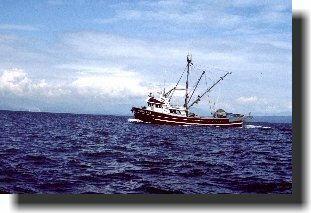 United States and Canadian fishermen are expected to harvest more than half of the Shuswap-bound sockeye as they funnel through Johnstone and Juan de Fuca straits on their way to the mouth of the Fraser River. Indian fishermen, sometimes clinging precariously to the canyon walls, could harvest another 50,000 sockeye as part of their food fishery. The sockeye salmon, the second smallest of the five species of Pacific salmon, weigh an average of three kilograms when they leave the Pacific on their 17-day journey to the spawning grounds. Traveling at an average speed of 30 kilometres a day, the salmon do not slow to feed. Instead, they live off the fat stored during their two years in the salt waters of the Pacific. As their upstream battle consumes their body fat and tissue, they undergo a remarkable transformation. 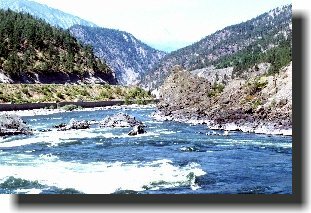 Their deep-sea blue-gray bodies gradually change to a brilliant crimson in their battle against such well-known obstacles as Hell's Gate Rapids on the Fraser and the many whitewater rapids on the Thompson. By the time the Adams River sockeye reach the mouth of the stream in mid-October, the transformation from blue-gray to crimson is virtually complete. In addition, the male of the species now has become grotesquely distorted with a humped back and a sharply hooked nose on his gray-green head. 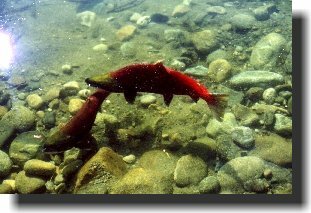 The sockeye salmon pair up and then begin their search for clean gravel where fast running water will insure an ample supply of oxygen for their eggs. The present peak years of the Adams River sockeye cycle are on a 2010 - 2014 - 2018 even-year basis, with much smaller runs occurring in the intervening years. In the early years of the 20th century, however, the peak runs were of a 1905 - 1909 - 1913 odd-year cycle. The change from odd to even years was caused by giant rock slide that almost wiped out the Fraser River salmon runs. 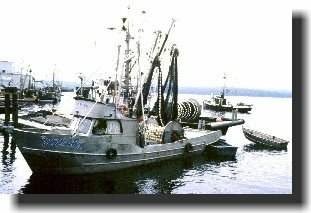 More than 31 million sockeye were harvested from the 1913 run, a catch total that has never been repeated. But when the remaining spawners reached Hell's Gate, they ran into an almost impenetrable obstacle caused by the construction of what is now the Canadian National Railway. All but the hardiest fish were blocked by the rock slides that narrowed the already narrow channel and created a five-metre-high waterfall. By 1915, the removal of 45,000 cubic metres of rock from the channel had eased the problem, but the 33-metre-wide Hell's Gate gorge still remained one of the toughest obstacles on the river. The migrating salmon have since been aided in their passage through Hell's Gate by specially designed fishways, the first of which was built in 1946 at a cost of $1 million. 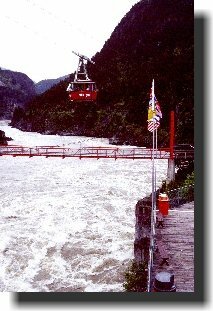 The design and construction of the fishway was complicated by the fact that Hell's Gate carries the water from 220,000 square kilometres of British Columbia--about one quarter of the province--and the river levels can fluctuate as much as five metres in a day. 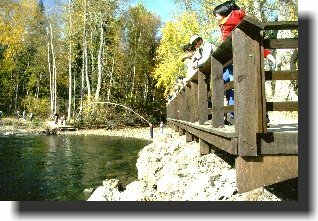 The first fishway proved successful and more were added in 1947, 1951, 1965 and 1966. The result of the slides and the rehabilitation efforts is the present four year cycle. Sockeye salmon also return to the Adams River in the between years but their numbers are not enough to warrant the attention and the displays of the Salute to the Sockeye. 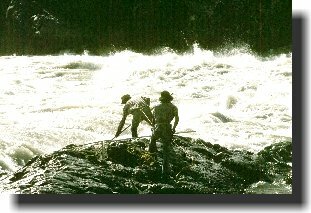 Since 1958, the Fisheries Association of B.C., local Indian Bands and service organizations, The Nature Trust, various federal and provincial government departments, and the International Pacific Salmon Fisheries Commission have hosted an educational display on the banks of the Adams River each peak year. The year 2010 marks the 14th Salute to the Sockeye. Although it is far too early to predict the exact dates, it will likely run from the Canadian Thanksgiving weekend to the end of October. For three weeks in October, 2010, British Columbia's Roderick Haig-Brown Provincial Park, on the banks of the Adams River east of Chase, will take on the atmosphere of a carnival. The scene isn't a typical fall fair or a rodeo, but the celebration of the return of millions of sockeye salmon and the renewal of life that follows. "The salmon runs are a visible symbol of life, death and regeneration, plain for all to see and share... The salmon are a test of a healthy environment, a lesson in environmental needs. Their abundant presence on the spawning beds is a lesson of hope, of deep importance for the future of man. If there is ever a time when the salmon no longer return, man will know he has failed again and moved one stage nearer to his own final disappearance." The year 2010 marks the 14th celebration on the banks of the Adams. the Salute to the Sockeye takes place on the dominant year of the four-year cycle. While the crowds visiting most British Columbia tourist attractions are waning, approximately 300,000 people are expected to walk the banks of the Adams River just to watch as many as two million salmon swim and spawn nearby. The Salute usually kicks off in the first week in October with the official opening ceremonies on the first Saturday. After a little more than three weeks, the activities wind down at the end of October. During that period, there will be park naturalists and fisheries personnel on site to answer your questions. I have attended almost every "Salute" since 1974, and if the past is any indication, I expect that the weekends will be busiest. May I suggest that if you can, you should plan your tour for a weekday. Weekdays may also not be too quiet -- during one "Salute" they had as many as 63 school buses on site at one time. Parking is plentiful at several sites near the Adams River. In 1998, the site sponsors introduced a nominal vehicle parking fee to help offset the costs of managing the "Salute". The crimson salmon are easily seen in the river. The displays include tents filled with everything from information on their life cycle to the best way to cook them. The only part of a carnival that will not be there is the rides. 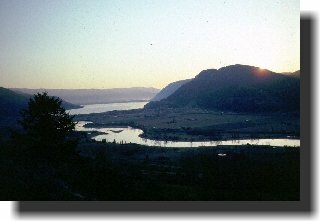 Roderick Haig-Brown Provincial Park is located eight kilometres northeast of the Trans-Canada Highway junction at Squilax, approximately 65 km east of Kamloops and 50 km west of Salmon Arm. 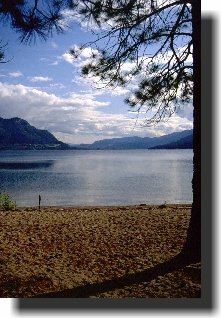 Camping is not permitted on site, but Shuswap Lake Provincial Park, 13 km farther along the same road as the viewing site, has 260 campsites. Many smaller privately owned campgrounds and resorts are also located nearby. Both Kamloops and Salmon Arm have full tourist facilities. In years past, the Salute to the Sockeye has been largely the domain of a select group of government agencies and local service organizations. The 1994 Salute changed that when business and industry recognized the value of conservation and the focus of the Adams River with sizable donations toward interpretation services and general operations. 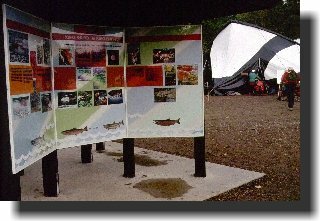 Local service clubs, under the umbrella of the Adams River Salmon Society, play a part by supervising display-filled tents, operating concession stands, supervising parking, and cleaning up after visitors that have, in the past, numbered well in excess of 250,000. The weather in the Shuswap can be variable in mid-October with warm days and cool nights. Warm, waterproof clothing and footwear suitable for scrambling along a river bank are essential. Although they may not be necessary, may I suggest that you pack along a pair rubber boots. Street shoes and spiked-heels are definitely a liability. Allow at least a day at the site to explore the river trails. The smaller channels often offer more natural settings for study and photography than are available at the main viewing area. Most important of all, leave pets at home. Not only do dogs frighten the salmon, but the dogs may become overly excited and leap into the fast flowing stream. Viewing platforms have been built on the river bank near the display area. 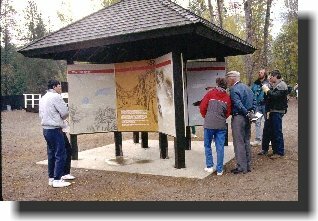 However, those interested in enjoying nature in a less formal atmosphere will probably take to the trails that follow the Adams River downstream to Shuswap Lake and for a considerable distance upstream toward Adams Lake. The Department of Fisheries and Oceans will very likely be tagging salmon at the mouth of the river in an effort to track spawning locations and numbers. In the past, there have been nature interpreters at the main viewing stands as well as at the river mouth. The autumn colors are usually at their finest during the Salute to the Salmon, making a camera and color film an essential piece of equipment. You may also find that that a polarizing filter is useful to reduce the sunlight reflections off the water and allow clear photographs of crimson salmon beneath the surface. Pack along plenty of film as your particular choice may not be available on site. Be sure to read other articles by Murphy Shewchuk in the BC Adventure Network!